Plaque presented to George Eisenberg, 15 January 2004. 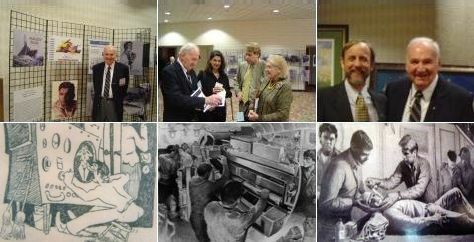 Top row left to right: (1) George, (2) with wife Gabriella, daughter Julie and her husband Joe Janson, (3) with fellow artist-historian Dean Mosher. Bottom row: portions of the exhibit of his work at the symposium. A gallery of George’s work appears on his web site. See also his account of sinking the Chevalier from 1943.